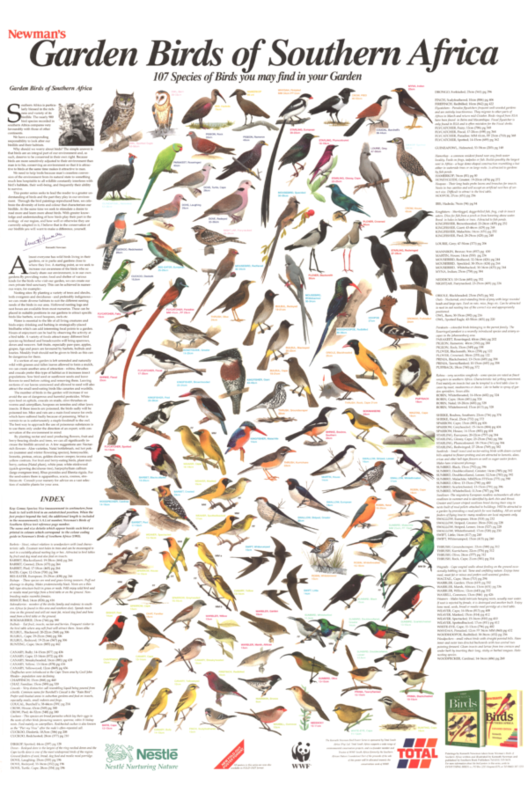 The “Newman Garden Birds of Southern Africa” wall poster was the very first large volume Natural History wall poster published in South Africa, and quickly found its way into tens of thousands of homes. Today it still shares in the public affection for Kenneth Newman’s work. Among the bird families represented on this poster are: barbet, bulbul, canary, crow, cuckoo, dove, flycatcher, kingfisher, mousebird, owl, pigeon, plover, prinia, robin, sparrow, starling, sunbird, swallow, swift, thrush, warbler & weaver. “Garden Birds of Southern Africa – (Classic Edition)” is one of 36 beautifully illustrated natural history posters produced by Korck Publishing, South Africa, and available now, world-wide, at a price you can afford!